Starring: Jeff Morrow, Mara Corday, Morris Ankrum, Louis Merrill, Edgar Barrier, Robert Shayne, Frank Griffin, and Clark Howat. As far back as I can remember, I have had what some might consider an unhealthy love of puppets. Nothing that would result in my being shunned by the community or locked up for my own protection, mind you. Just a fondness for puppets stretching back to my early childhood. As ridiculous as it may sound, when I was a little boy there were actually times when my parents could only speak to me through a small puppet intermediary named “Herbie the Hedgehog” (Oh, how I wish that was a joke). As I grew a little older—and started communicating to other human beings directly—I discovered the wonderful worlds of Sesame Street and Fraggle Rock. I’m not ashamed to admit (perhaps I should be) that to this day I still know the Fraggle Rock theme song by heart. Of course all of this culminated in my discovery of Mystery Science Theater 3000, where the antics of Crow, Tom Servo, and Gypsy only strengthened my love of puppets and ultimately sparked my interest in bad movies. What the heck does all of this puppet talk have to do with anything? 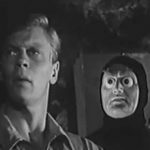 Well, the star of The Giant Claw, along with being one of the silliest looking monsters in the history of cinema, just happens to be a puppet. A gangly, gawky, Jim Henson fever dream of a puppet, but a puppet nonetheless. Just one picture of this wonky bird was enough to make me track down a copy of this movie. Needless to say, it was well worth my time. Kind of a punk rock Foghorn Leghorn, don't you think? 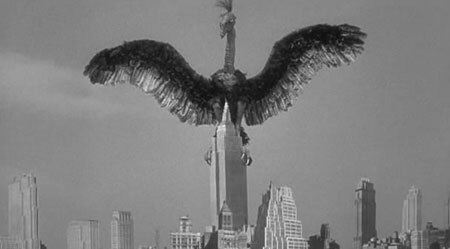 The plot of The Giant Claw is essentially this: A giant, inter-dimensional, anti-matter, space turkey has invaded Earth, hell-bent on flying through stock footage, scaring the holy bejesus out of French-Canadians, and smashing up scale model sets and airplanes. Trying to prevent this rear-projected buzzard puppet from wiping out all of mankind are private electronic engineer Mitch MacAfee (played by Jeff Morrow) and mathematician Sally Caldwell (played by the very lovely Mara Corday). Together these two devise a plan to destroy “The Claw” and save humanity from further embarrassing special effects. This remake of King Kong is a little weird. 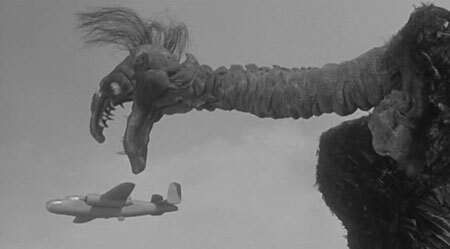 The Giant Claw is actually a pretty good 50’s era sci-fi flick. The script, despite being unintentionally hilarious at times, is mostly solid. Corday and Morrow have decent chemistry and seem to play off of each other fairly well, while the rest of the cast (including b-movie regular Morris Ankrum) are more than tolerable. 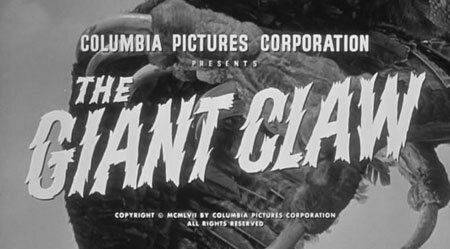 In fact, if the producers would have gone with their original plan to call on the talents of special effects legend Ray Harryhausen, The Giant Claw may have ultimately been considered one of the sci-fi classics of the period. Unfortunately (or fortunately, depending on your point of view) producer Sam Katzman opted to go with a decidedly cheaper alternative to Mr. Harryhausen, contracting a low-budget Mexican outfit to produce the monster effects. 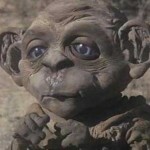 The resulting creation is arguably one of the most laughable monsters ever to grace the silver screen. 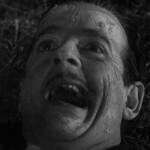 Resembling the grotesque mutant offspring of Don Knotts and a sickly turkey buzzard, “The Claw” is entirely too bizarre to be taken seriously. 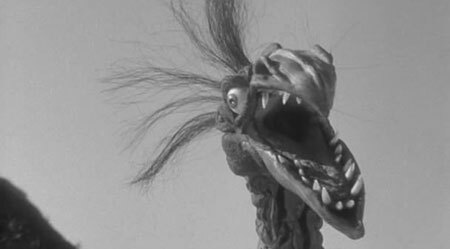 It is difficult not to laugh out loud (or “lol” for you kids out there) whenever its absurd feathery visage appears on-screen. In defense of the creators I will say that the actual puppet itself was fairly well done. Its eyes move and blink, the claws open and close, and the nostrils even flare menacingly. It’s simply a matter of the bizarre design. No matter how technically sound the puppet may have been, thanks to that ridiculous design it is about as frightening as Elmo in a turkey costume. So in order to prevent any future embarrassment, I would like to offer a word of advice to all of you filmmakers out there who are planning on utilizing puppets in your next feature. Take it from a lifelong puppet fan, if you are making a science fiction film and your horrifying hell-beast isn’t at least as menacing as Wayland Flowers and Madame, your movie probably isn’t going to be very well-received. Wait a minute…A gigantic, murderous, airborne Madame—now that really would be horrifying! 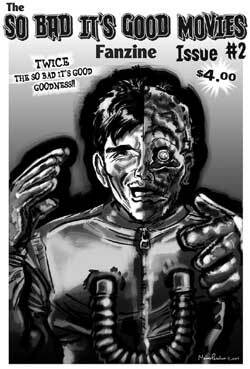 This review originally appeared in So Bad, It’s Good Movies, Issue #2. Try not to be horrified as this Jim Henson fever dream attacks a squadron of fighter pilots. Check out how the planes go from standard to delta wing design when “The Claw” attacks them. Neat huh?